Over the years, tulle skirts has definitely captured a big space in my heart (and my closet). Not only are they whimsical, romantic and fun to wear, there’s something magical about them that instantly makes me feel like a princess. Since it’s not every day that a regular girl becomes a princess, I guess I can pretend whenever I wear this. I wore this over the weekend to a local all white fashion show hosted by the San Francisco Bay Area Fashion Network (SFBAfn), but wanted to add some colors to my outfit. I played around with jewel tones and wanted to use the gorgeous hues of blue, pink and green, which of course made me wish for spring to hurry and come…Don’t be fool by the gorgeous sunshine during the day, because the temperature always drop significantly in SF at night, so I traded my crochet crop top for a cozy little sweater. More pics below + a Chictopia Giveaway! I will be at the Chictopia x American Apparel x Crossroads Trading Co. shopping event in San Francisco this Wednesday, January 30th from 6-9pm. If you’re in the area, stop by for drinks, enjoy live music, and best of all shop new pieces from American Apparel at 20% off and other exclusive designer resale pieces and local designers will showcase their newest arrivals for up to 50% off! Tickets can be purchased HERE for $20, but I’m giving away two FREE tickets selected randomly today. All you have to do is leave a comment in this post indicating you are interested in attending and I’ll announce a winner tomorrow via my facebook! Love your skirt and your shoes are fabulous! The all-white party sounds so chic and fun! I love everything about your outfit and the vibrant pink, blue and green you wore are the perfect little pops of colour. I especially like your lipstick! Oh no! Is it too late to win those tickets! How gorgeous & every inch a fairy tale-look KT!!!! The top & skirt are the stuff that dreams are made of!!! Beautiful, love the hint of colour on the accessories. You could have brides to be emailing you to make a wedding dress like this for them! So adorable and I agree you look like a pretty princess. Good golly, KT, you have THE most rockin’ body ever!! Always a pleasure seeing what you bless your body with. Thanks so much for stopping by my site! I’m so happy to have discovered your blog and AMAZING collection!! Seriously in love with your skirts… emailing you right after this comment! Cheers to great style! I absolutely adore this outfit, KT! I love the look of tulle skirts too but haven’t found an opportunity to wear one yet myself. I agree though, what girl wouldn’t like feeling like a princess? The fashion show looked like fun. Have a great time at the Chictopia event! Hi gorgeous! This post really does have that fairly tale feel to it. The all white combo is beautiful with all the light coming through. The pops of color are like little surprises and I like that you played with various colors. It seems you could write your own fairy tale in this! o.m.g. guuuuuurrrrrrrl. this is probably my most favoritiest look of yours. i know always always say that, but it just keeps getting better and better. you always take my breathe away with your beautiful stylings and amazing creations. AND your hubby always captures the best photos. then again, it’s not hard, when the subject is so freakin’ beautiful!! GORGEOUS GORGEOUS GORGEOUS. i want a tulle skirt so so so so bad. It’s my first time on your blog, but it most definitely won’t be my last. Your style is beyond chic and this probably one the best outfits I’ve seen in the personal bloggsphere. Now following you via bloglovin. Unas fotos preciosas! Estás guapísima!! First of all your husband’s photography skills is just blowing me away. I mean, I have followed fromyou the very beginning (a year ago) and your photos has always been nice. But I feel like it just gets better and better with each and every post! GOO Nate! :) But of course the vision behind the styling and actually making her own clothes is what I love about you. I love that you mix high and low and you are so creative. You never disappoint with your color choices and the way you put everything together. A true inspiration! I always enjoy your photos because you are brilliant with colours! Looking beautiful as always!! O.M.G. You look AMazeballs!! You look like a princess indeed KT! Wow, I love this look. 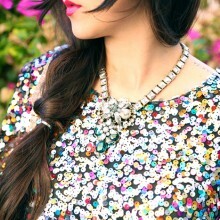 Love how in incorporate the colors into the outfit! And the shoes are so pretty!!! I just LOVE your style! This is so gorgeous! I absolutely LOVE this look! I want a tulle skirt so bad! 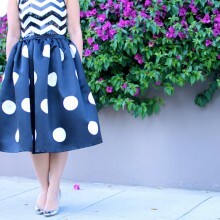 I think I am going to put my order in for that exact skirt and totally recreate this look! You worked it!!! I was thinking of paring a tulle skirt with a denim button down or solid oxford shirt but this lil’ lace crop top is all the RAVE!!!!! Thanks for the inspiration.